serious business. Video crews, professional photographers, hair and makeup artists and dozens of other volunteers converged at the zoo last month with a single goal in mind: to help 21 children find their forever families. There are currently more than 100 children in Miami-Dade’s foster care system who are ready to be adopted, dozens of whom are featured in The Children’s Trust web-based Heart Gallery; their heartwarming stories, images and videos can be viewed at www.miamiheartgallery.org. 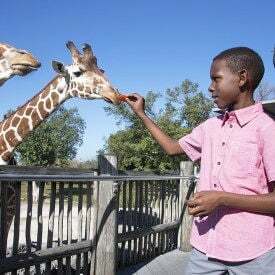 subtropical zoo in the continental U.S., feed a giraffe and meet Zoo Miami’s Ron Magill, who took some of the day’s portraits. 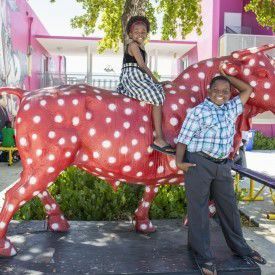 Approximately half of the children featured in The Children's Trust Miami Heart Gallery since its debut in 2009 have either been adopted or are in the process of being adopted. Aside from the lifelong joy and enrichment that adoption brings, families who adopt enjoy a multitude of supportive benefits, including college tuition waivers to any state university through Florida’s Department of Children and Families. Miami Heart Gallery is a partnership between The Children's Trust and Our Kids of Miami-Dade/Monroe, the local lead agency for child welfare in Miami and the Keys. Anyone interested in learning more about adopting a foster child should call Our Kids at 305.455.6241 or email Flora Beal at bealf@ourkids.us. Posted in News, Homestead, Miami-dade on Monday, March 25, 2019 10:40 am.